Johnson, Sarah Anne. 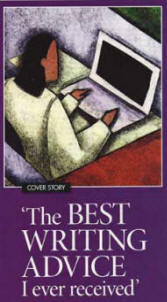 "The Best Writing Advice I Ever Received", The Writer, August 2010. In discussing a work in progress, Julie Brickman, an instructor at Spalding University, spoke to me about developing the 'interiority' of my main character. Interiority was a new term for me, and I liked it. She defined it as the conscious rendering of experience into understanding and insight, and she cautioned me against thinking that a character's thought had to be an abstraction or a result of intellect. Interiority could be everyday things, what passes through the mind. They might be recorded only as images. That opened up new possibilities of showing a character trying to find his or her identity. "Remove the narrative commentary on what you've just written. It's just distrust of yourself. Let the details and actions speak the conclusions. Play it off the money. Don't draw the conclusions for the reader. Don't explain every nuance. The abstractions are just notes to yourself." You can set a story anywhere. In my experience, write-what-you-know straightjackets the imagination. Write what you don't know; write what you dream about, what you long to know; write your passion. We write for the same reason we read, to get new experiences, new understandings, new ways to look at the world. If you're worried you don't know enough, calibrate your protagonist to your level of knowledge; make her a traveler; make him an outsider. What you know is emotional; it will come out in any setting. And you might surprise yourself by what you know in a different place. Many writers believe that thought is the equivalent of an abstraction and therefore to be avoided, but the ongoing inner processes of a character include the everyday babble of appetites, images, sensations, yearnings, and are what drives action in every scene. Interiors can be written in the same vivid, sensory language as anything else; they use scene, dialogue, color, realism, plot. One -third of Salman Rushdie's The Satanic Verses is a dream sequence, but other than the frame, the dream has the same drama as any other part of the plot. Show, don't tell, applies to the interiors of your characters. Scope is all those things that extend the range of a work of art. Generally, scope is made up of everything we forget to include or think is boring: finances, work, politics, shopping, philosophy, science. But made vivid, like Tolstoy (all of the above) in Anna Karenina, Andrea Barrett (science) in Voyage of the Narwhal, Milan Kundera (politics) in The Book of Laughter and Forgetting, Don DeLillo (grocery shopping) in White Noise.